Imagine you are in the mountains, the absolutely cool but thin air, resplendant rain, a million bird calls and the rush of a river. Panting, you make your way into an Assamese farmer's hut to sit down to enjoy the first harvest of the season. Vegetables such as gourd, mountain mustard greens, large leaf coriander, potatoes alongside various meats and birds such as pork, geese, pigeon served with a nice sticky rice along with the most delicate of them all - sautéed silk worms. No, I wasn't up in the valleys of Assam, I was at the home of the lovely Gitika Saikia who hails from Assam and hosted a 'Na Khuwa Bhooj' which translates as The New Harvest with Meal Tango- an online platform that helps hosts such unique meal experiences. 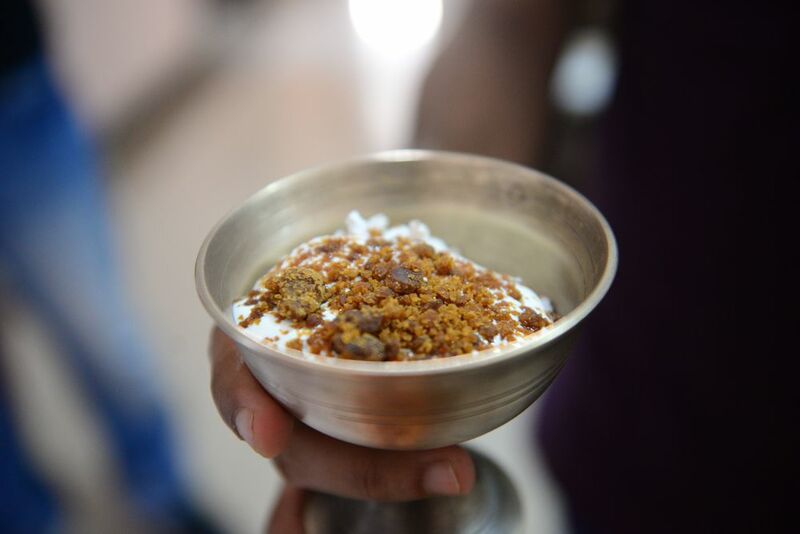 I trekked out to Malad, to experience a cuisine of a part of the country I have yet to visit and try the cuisine of. The menu posted on Meal Tango was enticing, goose, pigeon, pork, silk worms, mixed vegetable chutneys. I invited my two friends from work who were just as enthusiastic about the wild menu. We were a bunch of maybe 10 odd people all united by the love of wanting to try something unique. Gitika, excitedly walked us through the cuisine, explained that almost all ingredients are from Assam and that she either picks it up herself or has them couriered to her fresh just in time to prepare the meal. Her enthusiasm for the cuisine made the trek up to Malad completely worth it. After Gitika told us stories of the challenges tribal Assamese food faces with the ever popular Indian Chinese food, I realised this meal brought to us over 500 kms was extremely special and was probably dying in the region as well. 'Na Khuwa Bhooj'- celebrating the new harvest: Here is my take on the food. Hands down winner in the curries was the goose with gourd. The peppery stew was heavenly, cooked to perfection with tender pieces of goose. Next I really enjoyed the fatty pieces of pork with the mustard greens. As Gitika explained, this was a match made in heaven. My least favourite was the pigeon, mostly because it had tiny bones and very little flesh which tasted slightly gamey. The curry was delicious though. Im a huge fan of quail, I guess not so much pigeon. There was also an amazing assortment of chutneys, a grated carrot, coconut and peanut chutney, bamboo shoot chutney, an Indian olives chutney, an incredibly killer naga chilli hot oil, and a piquant pork pickle. The star attraction for me were the silk worms, I encountered these beauties way back in Chicago, with the Zambians. They would smuggle and gather round with a cold beer and fried silk worms in onions and garlic. I loved these crunchy, nutty beauties. I have never shied from from eating creepy crawlies, my firm belief that insects are an incredible source of nutrition and probably the only form of protein for many parts of the world. Its our developed, urban world that has lost touch with such a unique source of nutrition. I was glad to encounter the silk worms again. Gitika showed us the cocoons that she breaks open to acquire the worms, the cocoons are then woven into the precious silk we love so much. In short and long, the meal was delicious and here are some enviable photos for the brave ones to drool over. Before I forget, the dessert was simple but outstanding. Putting it all together. So simple and so good. Thank you Gitika for opening your home to us and letting us taste your delicious cuisine. This meal goes well with this amazing collaborative performance with Rabi and Pappon in Kaziranga.